Is it rice and peas or peas and rice?? That’s the life long debate between Guyanese and the Jamaicans and Trinidadians. I say, who cares? Potato…Potahto. 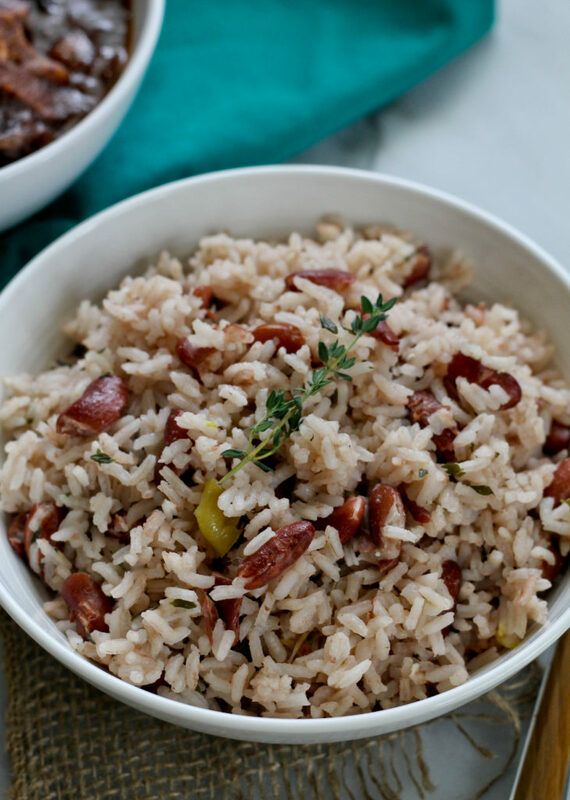 Rice is a main part of Caribbean food. It’s usually Rice with______ for lunch or dinner. After 30 years on this earth and eating rice almost every day, I have yet to grow tired of eating it. Even though I don’t need to eat rice every day, a few members of my family will throw mini hissy fits if rice isn’t present. 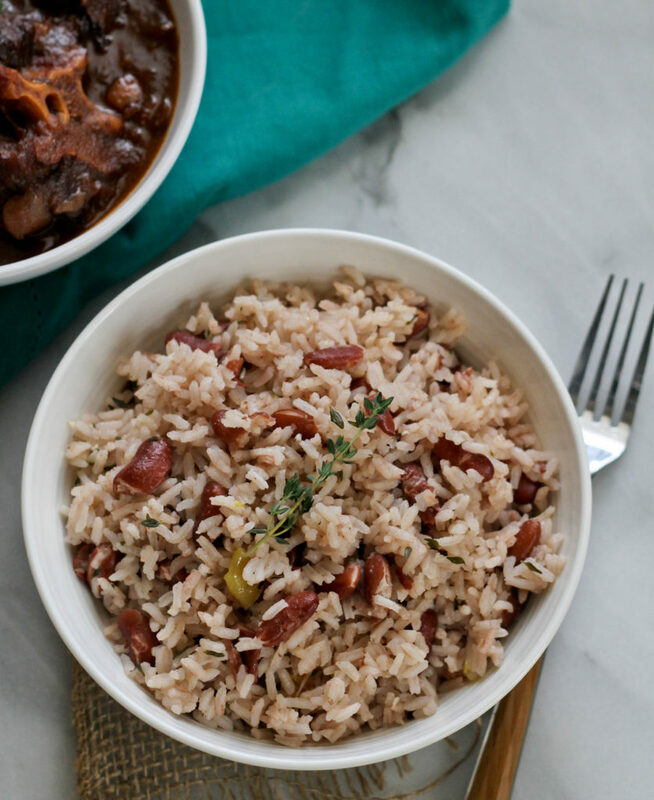 Peas and rice is usually served with some type of stew such as oxtail or brown stewed chicken. The combination is fricking awesome! I will be making jerk chicken wings to serve with this and a side salad. Lunch will be great!! Place beans in a bowl and cover with water. Soak overnight. Drain. Add beans with 3 cups water in a large pot and bring to a boil. Cook until tender. I’ve found that the cook time for beans varies from batch to batch, so cook these until you’re able to smash them easily with your fingers, but still firm. When beans are tender, add coconut milk, garlic, scallion, thyme and pepper; bring to a boil. Add rice, stir well then lower the heat. Cover pot and simmer for 20-25 minutes. Rice should be soft but not mushy. Fluff with a fork, then serve. I love beans in my rice. This sounds delicious. Hi Jehan- does it matter what type of long grain rice you use for this dish? I used a Jasmine brand and the results were nothing like yours! especially the color! I’m so disappointed in my first try on this! :( Help! oh also does is matter if the beans are from the can? Jasmine rice would work just fine in this dish, however I used uncooked/uncanned beans. The color of the dish comes from the liquid that the beans was boiled in, you will not achieve this color if you use canned peas. Hey there! I have been following you ever since I stumbled on your post. I am Indo-Guyanese now living in NE Atlanta with a very important question for you: Where are you getting your wiri-wiri peppers from here? I know it seems silly but I’m very curious, please help if you can!…………..Btw, your cooking and recipes are awesome! Lets see, I’m going to try this for my grandpas birthday. I always mess this rice up each time. So I’m hoping this works out for me. Looks so good. I apologize if this is somewhere else on your website, but the recipe says 1 bouillon. Is this a cube of chicken bouillon, beef bouillon? Thanks in advance. Veronica unless it’s a beef dish, it’s a chicken bouillon. Thanks so much for getting back to me, Jehan! I want to make it for my family on Saturday–so this is right on time. 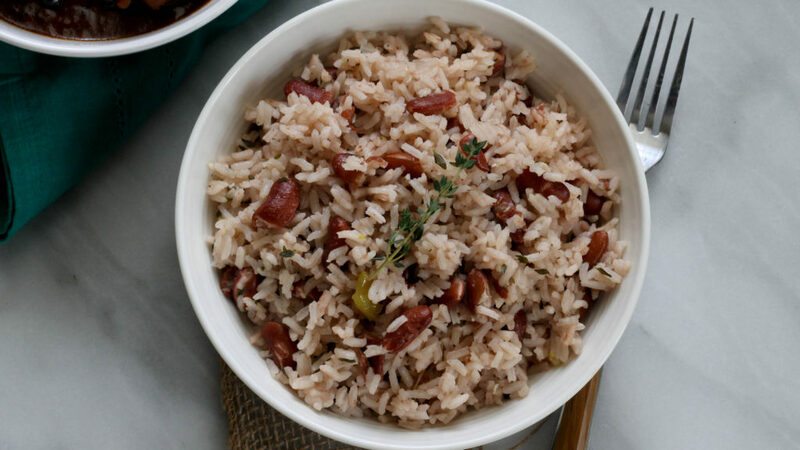 I’m from St.Kitts in the Eastern Caribbean which means I’m a Kittitian and there it’s officially called “Rice & Peas”. I can’t argue with that because by my logic there are far more Rice represented than Peas. Great recipe though.